VR, VR... For the youth of a nation. Nintendo has announced its fourth Labo Kit for the Switch, and will adapt the console into a VR headset. The DIY kit will include a cardboard set of goggles and five experiences that range from an underwater photo expedition, or defending against an alien invasion. The goggles don't include a strap, and there's also a screen holder included in the kit, allowing players to go through the different games with the VR turned off. The short play-time is probably for the best. Featuring a 720p screen, it's likely a Nintendo VR experience will leave your eyes needing a rest. 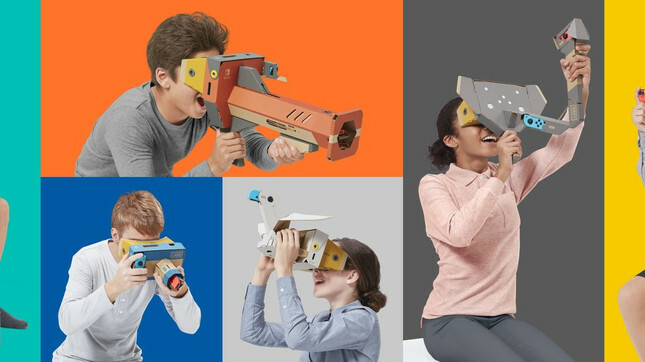 "This new kit builds on the core tenets of Nintendo Labo - Make, Play and Discover - to introduce virtual reality in a way that's fun and approachable for both kids and kids at heart," said soon-to-be NoA president Doug Bowser. The Labo range launched early last year with the Variety and Robot Kits then in July, expanded to include a Vehicle Kit. The Labo VR Kit releases April 12 as a complete set or as a starter version. Expansion sets to the starter version are also available for the bird & wind pedal, and elephant & camera.